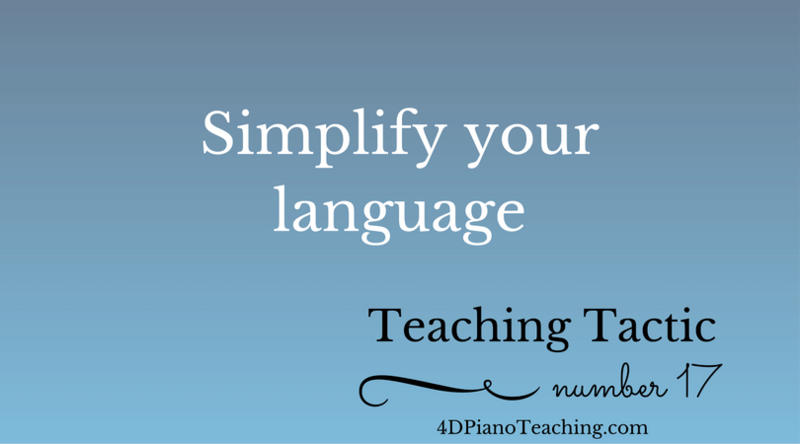 Another Tuesday means another Teaching Tactic here at 4D Piano! Today’s tip is to simplify your language. This is something that really sunk in with me when I first started ballet as a brand new beginner (read more about that here). Ballet is so totally new to me that at first I had to think really hard about everything I was doing. Many of the words the teacher was using made absolutely no sense to me. When the teacher said we were going to do eight changements I had no idea what that meant. I needed some demonstration or explanation. Even as I began to learn some of the terms, a quick and simple translation helped me process more quickly. When trying to learn a combination, if the teacher tells me to turn en dedans I can’t think fast enough to know which way to turn. But if she says to turn to my left I’ve got it. So what does this mean for piano teaching? When I ask a student to play with better dynamics, it’s worth taking an extra second to make sure they know what dynamics are. When I tell a beginner to use their fifth finger, it’s okay to also call it their pinky. My students may not know all of these terms that are part of my everyday language. Music and piano are new territory and many things are foreign. Studying the piano is hard work, but it’s our job as teachers to guide our students through the challenges. Anything we can do to make our directions more clear for the student is worth the extra time.